Hello from Day 2 of the Beer Bloggers Conference 2012. Hit the jump for the days events including a Leinenkugel lunch and an incredible comparative glass tasting with beer courtesy of Brooklyn Brewery! The morning started off with a panel on the three tier system. I feel this topic deserves a lot more attention than what I can provide in this post. So expect to see a post from me in the future containing what was discussed here as well as it’s history and other things. 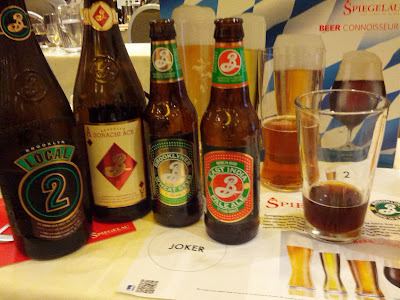 Hefeweizen – As we walked in to lunch we were handed a glass of Leinenkugel’s Hefeweizen. Now you may be thinking that Leinenkugel doesn’t make a Hefeweizen, well they haven’t for years but it’s back and tasty. Summer Shandy – Leinenkugel’s summer beer was paired with a delicious salad. I’ve had the Summer shandy a few times before and it holds its own against most other summer styles. 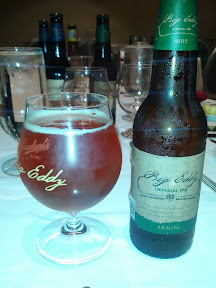 Big Eddy Imperial IPA – Woot! This is a mammy jammy beautiful beer. Great color and great flavor, I scored a bottle of this to take home so expect a full review in a few days. 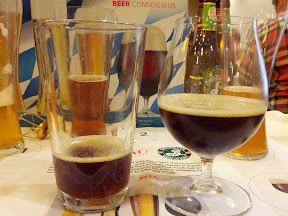 Big Eddy Wee Heavy Scotch Ale – This deliciously warm beer was served with some tasty desert. I’m not a food guy so I’m not even gonna get into how awesome this dish was. But the beer went great with it and packs a nice warming alcohol flavor. Again, I scored a bottle to take home so expect a full review soon. On retrospect the following is highly chaotic and perhaps not as informational as I would prefer. 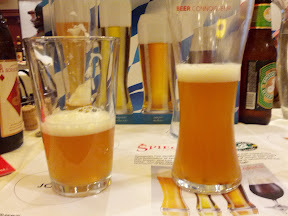 So I’m just going to polish it up a bit and then in a few days post a nice long article on glassware. HDTV vs. old school TV – This is the best possible analogy that I can come up with. It’s surround sound vs. apple head phones. An IMAX vs. a 13 inch black and white TV! Garrett Oliver hooked it up with a MAD lineup! Frosting on edge of glass shows that its insulating and keeping our beer cold! Science is amazing! 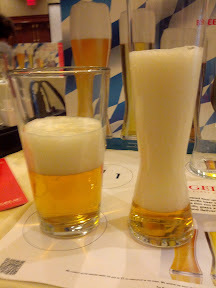 Like the Tall Pilsner glass the smell is FAR more aromatic in the Wheat beer glass then in the pint. It’s really crazy, I never thought there would be such a difference. 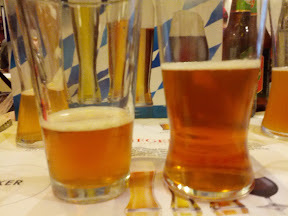 So I poured these 2 glasses myself back-to-back and the Wheat Beer glass is still far colder than the pint glass. Again, the smell is the most notable difference and is an astounding level of difference. This is a great beer BTW!